This simple design bathroom is all about using a number of finishes and colors for adding multiple layers to the entire area and theme. 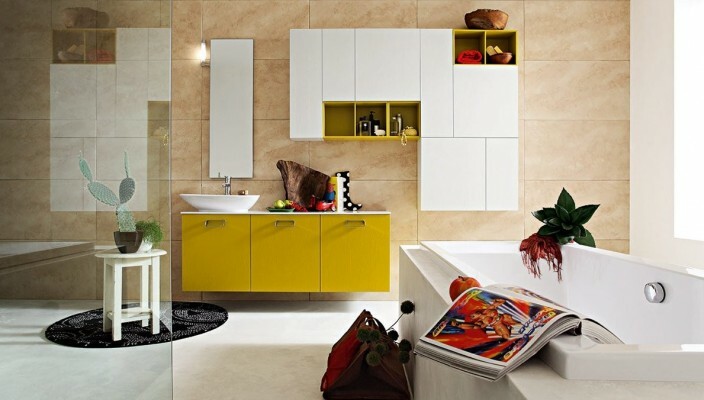 This innovative bathroom concept adds colors to the modern bathroom using both natural and paint finishes. The walls are in a different light tone, while the bath area and bathtub is white. The colors come from addition of few plants and vanity units. The vanity units have a yellowish finish for the doors, while the green color of the plants bring a natural charm to the bathroom. Towels and other essentials have been placed in red for some additional effect. Stunning and breaking the jinx of single colored tones for the bathroom, this one is just right for those who want colors in balance.